This is a Pharaoh Ant. 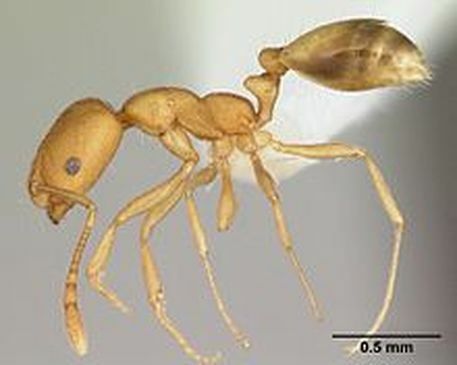 Pharaoh Ants are very small ants that are mostly yellow with tiny black and red spots. Like most ants, Pharaoh ants feed on a wide variety of food. They are less likely to be able to bring down other larger insects because of their small size, and would rather seek out sweet treats. You can often find these ants in bakeries or other places that serve food. How do Pharaoh Ants get into my home or business? Pharaoh Ants are super tiny so they can get into places even other ants cannot. Since they are so small, they will actively seek out heat sources to maintain body heat. Because of this fact, they are often found in restaurants, kitchens, diners, pizza shops or any other place that makes food in a warm environment. Pharaoh Ants can live in tiny places, so often you will get rid of a batch of them only to find them coming back. It's better to have us do the job right the first time so they won't keep coming back again and again. Give us a call and we will be happy to set up a time to help with your ant problem! Click here for information about Pavement Ants!